She looks amazing! And it’s just a 30-min drive?! People from Portland are lucky! I’ll make sure to go here if we get a chance to travel to the US in the future. If you are anywhere in the Pacific North West of the US, this should be on your list. But the whole region is breathtaking. Driving through this part of Oregon was breathtaking. From being snowed on at Mt Hood, the view from Vista Point and then this stunning waterfall. The area is a must visit for scenery lovers. I’m glad you’ve had a chance to experience it first hand, Dean. Yes, a definite must see. OMG, that is gorgeous! How come I’ve never heard of Multnomah Falls before? You write about it so beautifully too! What a gorgeous waterfall. It looks like a bit of a hidden gem. I’ve heard so much about Oregon I feel like I really need to visit soon. If you do get to visit, I think you’ll be blown away, Christina. It is one of the most beautiful states…. and so green it makes you ache. What a stunning location and falls! I love that it’s so close to Portland too. Definitely going to have to make time for it on my next trip! Yon u’ll be very glad you made the time, Kelly. And there are several other smaller falls very close by. If you take that earlier Troutdale exit, you can see several of them on the way to Multnomah. I’ve been to Multnomah Falls many times. It is always a pleasure. I didn’t realize it is Oregon’s #1 most-visited natural attraction. I hope to return once again later this year. Then you know its majesty, Carole. I’ve been told by someone who should know that not only is it the #1 “natural” attraction, but that it was for many years the #1 tourist attraction overall… but that it has been overtaken by Spirit Mountain Casino! Hmmmm…. I have only been to Multnomah a handful of times but siren, indeed. Great description. So appealing and majestic. Thanks Charles. She certainly did call to me! I love waterfalls and this one looks gorgeous! I would love to visit. My mom used to live in Oregon and told me about all of the great nature. Your mom certainly had it right, Nathan. It is a gorgeous state all around. The very definition of the color green. In all the years (6) I lived in Portland, I only visited Multnomah Falls a couple of times. It’s truly beautiful and serene (especially if you manage to avoid the tour bus crowds.) The entire Gorge is an incredible experience. Indeed it is, Elaine. Unfortunately on my last trip, we were in a bit of a rush, so did not take the whole scenic drive through the Gorge. Next trip for sure! This is one of my must-see places when we visit the PNW later this year. Thanks for sharing, pinned for later! Thanks, Micki. Do make that outing. You’ll enjoy it. The Multnomah fall is stunning but not one that I’ve heard about. I love your video. Thanks Bola. Actually, there are several of these very high waterfalls along the highway from Portland through the Gorge. Multnomah Falls is the highest and most beautiful, but the entire string of them is stunning. Do you get wet when you go on the Benson Bridge? Do you need full waterproof gear? Jaime, you will get a little wet from spray on the Benson bridge, but not soaked. Most people don’t wear rain gear. It’s not like Niagara. The amount of spray depends on the time of year. The “high water” time is in late winter and early spring, when the snowpack is melting. In summer, the water volume is much less, so less spray. Thanks Nausheen. I hope you get to see it for yourself soon. You’re welcome, Jazzy. I hope you get to make that trip soon. A a waterfall aficionado, you should take the Troutdale exist and you will see several others along the way to Multnomah. Multnomah Falls is a siren indeed! We can’t wait to see this amazing waterfall in person. We have family in California and are hoping to visit CA and the northwest later this year. 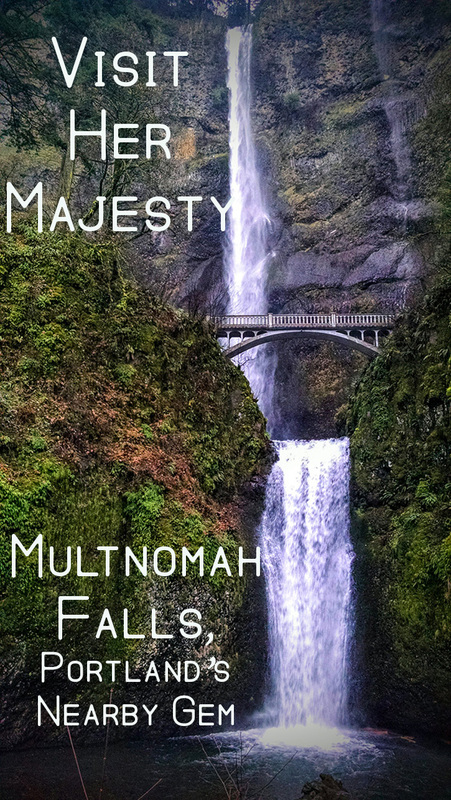 Multnomah Falls will definitely be on our list. Thanks for covering it. You’re very welcome. I promise you won’t regret a visit to Multnomah Falls. If you have the time, I heartily recommend taking the slightly slower drive, getting off the highway at the Troutdale exit and taking the historic Columbia Gorge Highway. You will see several other waterfalls along the way. The Gorge is wholly beautiful. Wow! Nicely done–makes me want to get in the car and just go! You would love it, Vicki. And it is so easily done! Ahh, give in to the scratch, guys. Make it happen. Thanks Danijela. I have only been there in winter and summer, but would love to see it myself in the Fall. I had to use my imagination for that, but I’m sure it would be gorgeous! Beautiful description. I kept looking through your pictures to find this beautiful woman you were talking about!!! Lol. The falls is beautiful. I wonder how it got its name or what it means. Multnomah Falls looks majestic! I’d definitely chase this one when I go to Portland! Oh yes, Trisha, perfect for waterfall chasers! And there are several more in the immediate area! This falls are so picturesque. I am adding them to my bucket list! You will enjoy its majesty when you get there, Agnes. Stunning place! Thanks for the info. I was there many years ago and it seems like there was a legend associated with it. You could imagine seeing the image of an Indian princess or maiden in the falls because died there (other details of the story escape me at the moment). If it wasn’t this falls can you think of a similar falls where this image is visible in the waterfalls? I took so many photos to try and capture the image and finally got one but unfortunately thise photoshave not yet been unpacked here in my new residence since my moving boxes just arrive last week! You’re right about the legend, Patricia, though there are a few variations on the myth. One of them says that the tribe had been struck by a horrible disease and everyone was dying. She volunteered to die to appease the gods and end the plague. She went to the top of the falls and threw herself off the edge. The plague ended and her people were saved.